Are you considering upgrading your hay storage, but aren't sure what your options are? Our hay storage buildings are ideal for storing hay and grain. They can be installed in a matter of days on any surface and are considerably less expensive than a wood or metal building. Storing your hay supply in dry, well-ventilated conditions means that you'll save money and time. Read on to discover the importance of storing hay and the benefits of the options we have to offer. Why is covering hay important? Covering hay with a storage building is necessary not only for economical reasons, but also for the health of your animals. Hay storage protects it from the elements, and keeps it from getting too wet or too dry during the various seasons. The snow and ice in winter months can cause mold and bacteria to form, which becomes hazardous for your animals. Hay storage also serves as protection against deer and other animals that can spread disease. Uncovered hay causes a loss of up to 31% of its nutrients, and in many cases, animal refusal. The losses from uncovered hay can amount to $10 per bale, and a total loss of up to 50% of hay bales overall. What types of hay storage does TekSupply offer? 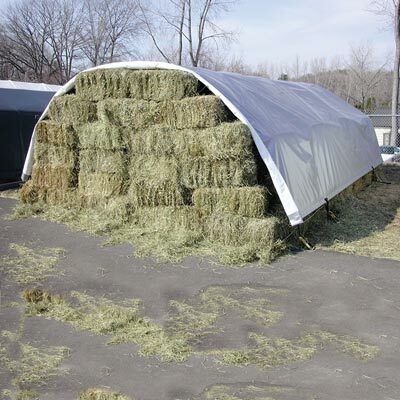 TekSupply offers hay storage in the forms of tarps and buildings. Tarps are an economical solution for reducing spoilage, and are available in different fabric weights. There are many sizes available, but you also have the option of custom ordering virtually any size tarp. They come with up to a 5-year warranty, depending on the weight of the tarp chosen. ClearSpan structures offer a more long-term solution, and are ideal protection from wind, rain, snow and sun. These buildings are available in many sizes and types, including our Pony Wall, Freestanding and Econoline models. What are the benefits of ClearSpan hay storage buildings? 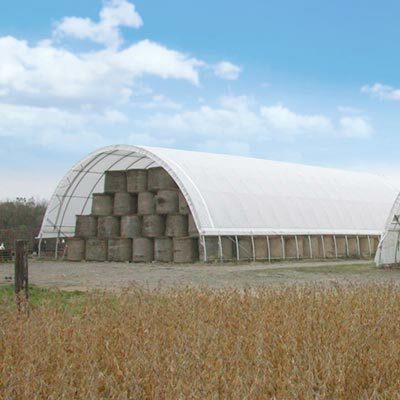 ClearSpan hay storage buildings are a great way to save time and money all year long. Avoid shoveling and needing to break ice on the hay over the winter, and have the benefit of a UV-protected cover in the summer. With all of our buildings, inside temperature is approximately 10° to 15° cooler in the summer and warmer in the winter. Since ClearSpan structures are more economical than a wood or metal building, you get more space for your money. This means the convenience of extra storage space for your tractor and equipment. These structures are easy to assemble, have customizable options, and can be relocated if necessary. Building covers are under warranty for up to 15 years, depending on which building you purchase. Since you will be losing virtually no hay to spoilage, you should expect return on investment in two to three seasons. 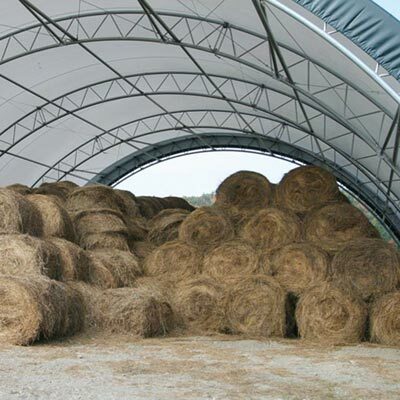 What different ClearSpan hay storage building options are available? Several types of buildings are offered, each with different customizable options. 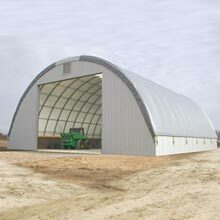 Our buildings are constructed from USA-made triple-galvanized steel and custom manufactured in Dyersville, IA. The foundation requirements are minimal, so you can choose between installing on the ground, or on blocks or pony walls for additional height. You also have the ability to choose other options such as cover color or end panels. One of the most popular types of hay storage buildings we offer is the 30'W by 72'L Freestanding Building. This Freestanding Building has the recommended 4' rafter spacing, comes in your choice of several custom colors, and comes with a 15-year warranty on the 12.5 oz., 24 mil polyethylene cover. Another popular option is the 30'W by 100'L Econoline Building. This Econoline building has 5' rafter spacing, comes in your choice of white or green cover, and comes with a 7-year warranty on the 10 oz., 22 mil polyethylene cover. While the Freestanding Building is suitable for areas that experience heavy snowfall and harsh weather, the Econoline Building serves as a more economical solution to your storage needs and is not recommended for this type of environment. If you need a building wider than 45', the Hercules Truss Arch Buildings from our partner, ClearSpan Fabric Structures, are an excellent choice. They are custom engineered to your location and feature 12.5 oz., 24 mil polyethylene covers that have a 15-year warranty. How long does it take to get my building? Our buildings are made to order by TekSupply in the USA and depending on the time of year, manufacturing for most buildings can take 8 to 21 business days. Please take this into account when purchasing. If you have an urgent need, we might have a building ready for immediate shipment. Please check with your sales associate to see if expedited/rush service is available. Have questions about Hay Storage? Visit our Live Help page or Contact Us.